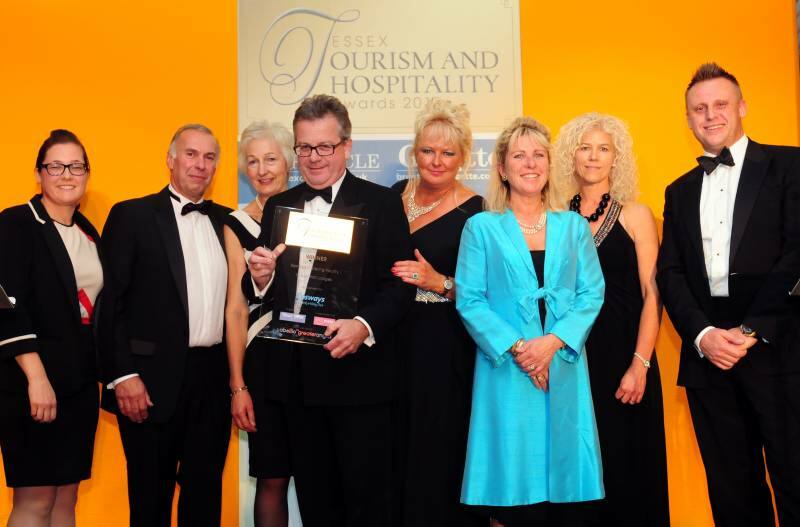 Wakes Hall Lodges, Wakes Colne, Colchester has been crowned ‘Best Self Catering Facility in Essex’ at the Essex Tourism and Hospitality Awards on 14 October 2015. The luxury 5 AA star self-catering lodges were launched in 2013 and offer the perfect place to unwind in the tranquil beauty of the Colne Valley. Each lodge, which can accommodate from two to four people, boasts lavish interiors, the very best of open plan living, private terrace with hot tub and dramatic countryside views. The lodges have been specially designed to be carbon neutral and thanks to their eco design keep visitors snug during the winter months. Wakes Hall Lodges is set within the rolling hillside of the Colne Valley and also offers guests fishing in its two acre lake, which is fully stocked with carp and rudd. Wakes Colne is just a stone’s throw from the historical viaduct at Chapel and just a 20 minute drive from Britain’s oldest recorded town, Colchester and world-renowned Constable country. 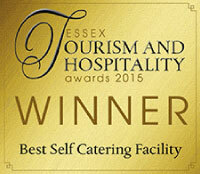 The Essex Tourism and Hospitality Awards, recognise the best attractions, restaurants and pubs the county has to offer. The winners in each category are those deemed by the judges to offer the best value for money, variety and quality. Wakes Hall Lodges will now go through to the national final organised by Visit England. As the open fishing season gets underway you could be enjoying fishing at a private lake, nestled on a country estate amid the tranquil beauty of the Colne Valley. Our two-acre manmade lake at Wakes Hall Lodges, Essex, is well stocked with carp and rudd and has plenty of places for keen fishermen and women to set up their tackle. When the fishing day is over you can relax at your luxury lodge, just metres from the lake, in your own private hot tub and enjoy the long summer evenings and appreciate the breathtaking scenery. And of course if you, or your travelling companions, don’t want to spend the whole time fishing there are ample opportunities for getting back to nature with walking, jogging, cycling or horse riding and every lodge also has a barbecue so you can cook and eat outside. Owners Nick and Clare Percival commented: “Since we launched the lodges we have had a lot of people take advantage of the fishing facility and enjoy many relaxed hours at the edge of the lake. Wakes Hall Lodges offer luxury one or two-bedroom holiday accommodation with fully fitted kitchens and bathrooms boasting a free-standing bath and walk-in waterfall shower. They provide a perfect getaway at any time of the year and also boast flat screen television, a music system and WiFi. Our lodges have recently been awarded a prestigious five-star AA self-catering rating which means accommodation has exceptional and outstanding levels of comfort throughout. To fish on the private lake at the lodges you need to have a fishing licence and to bring your own fishing equipment. The owners of Wakes Hall Lodges, one of Essex’s hidden gems, are celebrating after scooping a prestigious AA five-star award in only their second season. The five lodges, nestled on a private estate amid the tranquil beauty of the Colne Valley, have been rated as “exceptional and outstanding” by independent judges. Owners Nick and Clare Percival commented: “We have worked extremely hard to make our lodges the best they can be, providing a perfect venue for a quiet getaway or fantastic accommodation for visitors to the area. Wakes Hall Lodges offer luxury one or two-bedroom holiday accommodation complete with outside hot tub and close to a private fishing lake. They provide a perfect getaway for couples or families to relax and spend quality time together. 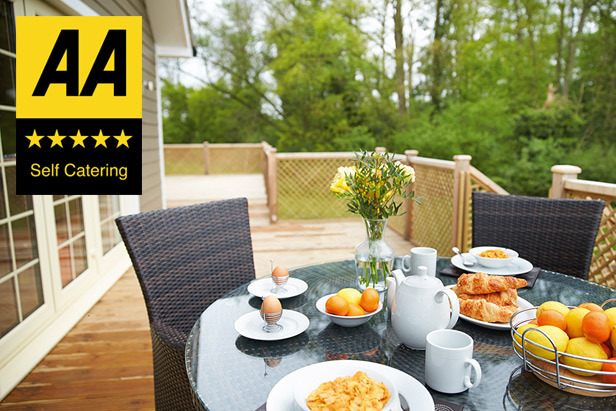 A five-star self-catering rating from the AA means accommodation has exceptional and outstanding levels of comfort throughout. High quality furniture with striking interior design, an excellent range of kitchen appliances, cookware, crockery, cutlery and utensils all in pristine condition. Accommodation assessed by the AA is rated under a set of common quality standards agreed by and AA and the UK tourist authorities. The common standards make types of accommodation easy to understand and give visitors confidence that establishments can meet the standards you require.